Have fun and adventure with Dora in the kitchen cooking different foods from the menu. Dora's Papi is going to cook one of the delicious recipes from their cookbook. He needs help picking a receta and then finding all the right ingredients for it. Your little chef will love helping Papi cook one of his and Dora's favorite recipes. Choose from 10 excelente recipes including cornbread, cookies, and eggs with sweet plantains. Use the mouse and click on Recipes for the English version or Recetas for the Spanish. Then find the ingredients that Dora prompts you to find. This is more of a matching game, there are no real measurements involved. Go to NickJr.com's Dora's Recipes section for real Dora-inspired recetas! This game has one level. If you want to play Dora The Eplorer Dora's Cooking in La Cucina games online you have come to the right place! 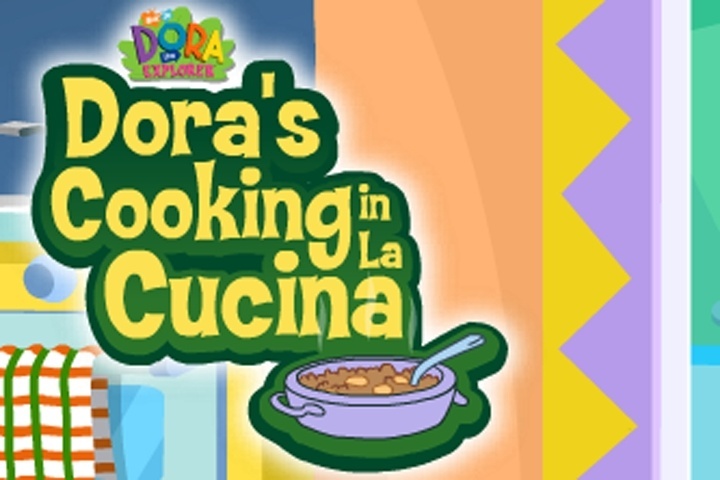 GamesLoon adds new Dora The Eplorer Dora's Cooking in La Cucina games every week. This is your game portal where you can find the biggest collection of free Dora The Eplorer Dora's Cooking in La Cucina games online. Do not forget to rate our Dora The Eplorer Dora's Cooking in La Cucina free online games while playing!